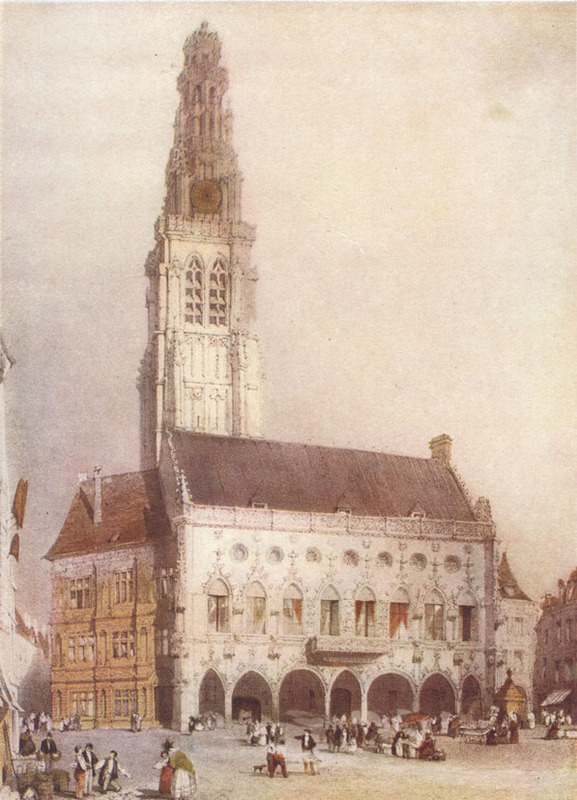 Arras: Hôtel de Ville in Beautiful Buildings in France and Belgium by C. Harrison Townsend, pre-WWI picture by T. S. Boys. From, Beautiful Buildings in France & Belgium, Including many which have been destroyed during the war. Reproductions in Colour and Monochrome from rare old Prints and Drawings, by and after Prout, Boys, Coney, W. Callow, David Roberts, C. Wild and others, with descriptive notes by C. Harrison Townsend, F.R.I.B.A. ; New York: The Hubbell Publishing Co., 1916; pp. 45-49. T was at Arras that, after the battle of Agincourt, the English and French signed their Treaty of Peace, but the name of the little town will for ever be associated with war of even a fiercer and more terrible kind. The beautiful Hôtel de Ville was the particular mark of the German gunners, and, of the seven famous Gothic arches of its lower story, but three now stand — and those chipped and battered and all but destroyed. The upper stages of the Belfry, finally yielding to the bombardment, fell in ruins on November 23rd, and, beyond the height of the ridge of the roof, the tower no longer exists. The Hall, standing in the then picturesque Petite Place, was one of the finest in the North of France, and, like many civic buildings of that district, showed in its design strong Flemish influence. The arcade of arches of various sizes giving on to the Place has considerable affinity to that of St. Quentin (see page 164), a resemblance more complete than the reproduction of Boys’  drawing suggests, since the original tracery of the Gothic windows was restored in 1837. The principal side elevation was in an elaborate Renaissance style, probably dating from 1572.